It’s nearly the end of January, and I can already hear those weight-loss New Year’s resolutions dying a slow death. You’re too tired, too lazy, too unmotivated. Well up and at ’em, kiddos, because ARAWELLA has just the fitness app for you: All-in Pedometer, an app that measures your steps and has more functions than a Swiss Army knife. Not only does it measure steps taken, but it also measures calories burned, pace set, average speed, etc. etc. All these serve to keep track of all the (good) changes in your body. The first thing you must do upon launch is to set up your profile (under the More tab). That way, you can set your body parameters and forgo calibrating your strides altogether. You can also set weight-loss, size, and distance goals here. If you’re serious about losing weight, you might want to read the tips found here, as they are presented in a way that virtually anyone can follow. Once you are satisfied with how things are set up, tap the Meter tab to start adjusting measurement parameters. The counter counts off your steps by default, but you can have any of the six quantities above it displayed instead. Likewise, you can do the same with the line graph below the counter; just tap on it to change what it’s mapping. To clear the current data from the screen, tap the yellow Lap button to access its menu. The icons surrounding the counter are to further aid your health quest. 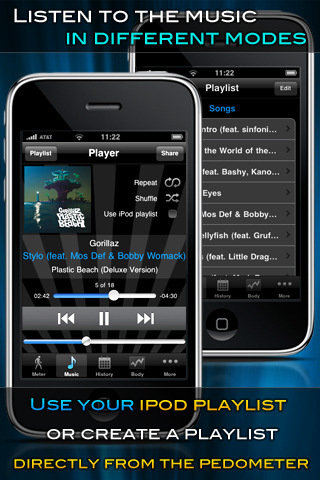 Tapping on the music note will take you straight to the Music tab, where you can compile a list of workout tunes to play from the music already on your device. Right below it is the metronome icon, which is a built-in pacer that will let you know when you’ve exceeded the desired speed, pace or step frequency. If you just want to work out for up to a certain time, distance, or burned calorie, just use the short-term fitness timer (the alarm icon), and it’ll go off once you reach your goal. When you’re ready to set off, tap Start (in the middle of the screen), or Lock Screen (the red button right above the More tab); once you start walking, the counter will automatically identify the speed of your steps: walking, jogging or running. Perhaps the greatest thing about All-in Pedometer is the fact that it is GPS-independent, so you aren’t tied down to needing an Internet connection–instead, this app uses the accelerometer to measure steps. People interested in tracking body changes will probably want to use the Body tab, which allows you to input your body data everyday. If you input a desired parameter, it will show up as a green line on the chart, so you’ll know how far you have until you make your goal. Using the data, the body tracker also automatically calculates your BMI (body mass index) and interprets it for you. There is a Report function for the body tracker, which lets you see a detailed log of the changes in your body over 7, 30, and 90 days. A similar Report function exists for your workouts over 7, 30, 180, and 360 days, or over a period of your choosing; these yield totals, averages, and line charts. I will tell you right now: I am among one of the most exercise-resistant people ever. Moving faster than a slow saunter? Forget it. But All-in Pedometer actually makes me want to go out and walk around just for the sheer heck of it. It’s very satisfying, looking at actual numbers and being able to chart one’s progress. Additionally, nearly all the data that comes out of your input can be shared over social networks, which gives competitiveness a little healthy boost. This app is just about perfect: huge counter that you can glance at (no more squinting for the visually impaired), measurements for practically everything under the sun, a great design to display all that lovely information, and more functions than you can shake a stick at. All-in Pedometer is not a battery drain at all, so even if you go for a multiple-mile walk, you probably won’t have to worry about your device dying (but do make sure to start out fully charged, just in case). It can’t work in the background, but as the developers explain it, it’s not because of the application, but “because of iOS4 multitasking limitations.” But who wants to be playing around on their device while getting their workout on, anyway? I am definitely not the only person who says that we all need to be a little more active, so you might as well put that device to work and download this $1.99 pedometer app, because it’s probably glued to your hand anyway. It’ll be good for you, trust me. 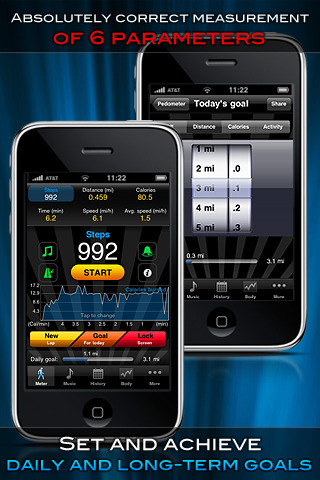 AppSafari review of All-in Pedometer was written by Julie Guan on January 25th, 2011 and categorized under App Store, Featured, Health, Utilities. Page viewed 6633 times, 4 so far today. Need help on using these apps? Please read the Help Page. The Pedometer stops in the middle of the jogging. Can anyone tell me the reason for this? For e.g., pedometer counts all parameters for 31 minutes and then stops; because of this activity after 31 minutes is not counted.